MTF has announced five different EOS R adaptors for Canon FD, Nikon G, PL-mount, Panavision, and B4 lenses. And it has adaptors for the new Nikon Z mount too! MTF is a UK-based broadcast services specialist which sells a wide range of video/movie gear but also makes its own premium-quality lens adaptors. Its managing director Mike Tapa says the company has been working "tirelessly" to make these new adaptors since the launch of the Nikon Z7, Nikon Z6 and Canon EOS R mirrorless cameras, and considers these cameras a genuinely interesting proposition for film makers. Lens adaptors are used widely by film makers to mix and match different camera bodies and lens brands, and manual focus and exposure are the norm for most videographers in this area, so as long as a lens physically fits, you're ready to go. The PL and Panavision mounts may not be well known to stills shooters, but they are the two most popular lens mounts in high-end professional cinematography. The B4 mount is designed for 2/3-inch sensors widely used in broadcast cameras. 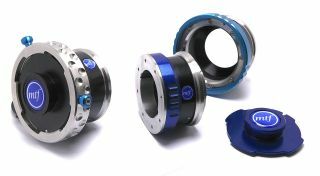 MTF designs, manufacturers and finishes its lens adaptors itself. They main body is made from HE30 aluminium with a stainless steel seating face. They are 'pre-shimmed' to ensure the correct lens-flange-sensor distance for each lens format, and spare shims are included for fine tuning. The EOS R has drawn a certain amount of criticism for its 1.7x sensor crop factor in its 4K movie mode, but this does correspond well with the Super 35 format used by Canon's own Cinema EOS cameras and other movie equipment. MTF has yet to announce prices for its new EOS R adaptors, but the company has already announced Nikon Z adaptors and its PL to Nikon Z Mount Adaptor is on sale for £420 (about $549) so these are definitely premium-quality adaptors for professional film makers. What all these adaptors do, however, is open up access to a large number of traditional and current professional video lenses.